Our idyllic lakefront cottages are located directly on the shores of majestic Lake Willoughby, in Vermont’s scenic Northeast Kingdom. This picture-book fresh-water treasure is commonly referred to as the “Lucerne of America.” It sits on 4.3 acres that are embellished with 330 feet of magnificent lakefront and provides everything you could ever wish for in terms of recreation and relaxing leisure. Find complete repose in rocking chairs on the porch; breath in the fresh air and enjoy the opalescent dawns and the saffron sunsets. Or, you can get active and enjoy nature in all its purity by kayaking/canoeing, hiking, or mountain biking. Appreciate the clear, tranquil lake by launching a boat, or doing whatever water sport your heart desires. Come see how enchanting Lake Willoughby can be — let it delight your eyes and rest your soul. 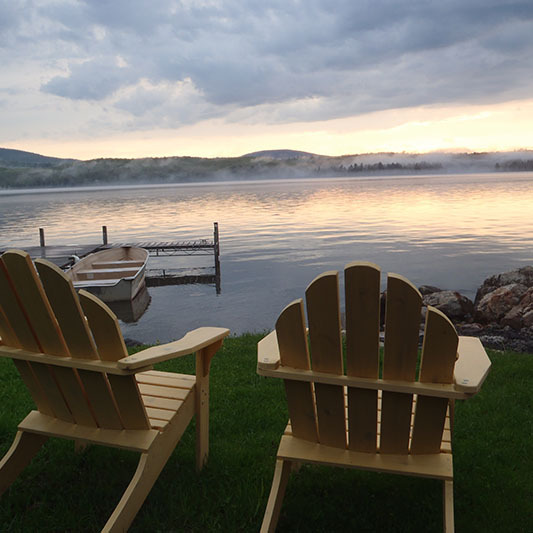 Every season offers something special at Mountain Lake Cottages, and beautiful lasting memories are created year-round. Ask us about our mid-week package for 2 nights (Monday-Thursday) that includes a 3-hour kayak/canoe excursion on Clyde River for $350 (for 2 people). Available from mid-May to mid-October.